Will Foxconn Deal Fight Poverty? Legislative language suggests this. What are the deal’s true aims and costs? The bill goes on to say that WEDC shall specify whether the designated zone “is located in a tier I county or municipality or a tier II county or municipality.” It adds that WEDC “shall, to the extent possible, give preference to the greatest economic need.” The bill’s language, if read alone, gives the impression that a prime motivation for choosing Racine or Kenosha counties is to attack pockets of poverty in those counties, and perhaps Milwaukee as well. However, I am not aware of any mention of poverty reduction in the discussion. One would expect some analysis of the likely effect. At the very least, I would expect some analysis of the home ZIP codes of people at the time they were hired at the Amazon and Uline facilities which are located in the area where Foxconn would locate. That analysis could give a rough approximation of the effect on poverty of the Foxconn facility and would, I estimate, take less than a day. I suspect that the real motivation behind the economic distress language is not concern about poverty. Instead, it’s meant to create a legal fig leaf to disguise the fact that, for all intents and purposes, the bill is a private bill aimed at subsidizing a single company, Foxconn, to convince it to build a plant in one of two counties. Yet nowhere does the bill utter the words “Foxconn,” “Racine,” or “Kenosha.” There is a reason for this; authors of Wisconsin’s constitution plainly dislike bills to benefit one person or entity. The Wisconsin legislature employs highly skilled bill drafters who know that by employing generic language they can guard against a constitutional challenge. No more than one financial services technology business that, after completing a competitive corporate relocation process, retains its corporate headquarters in this state and retains at least 93 percent of its full-time employees in this state who were identified as being full-time employees of the business in the base year, as determined by the corporation. Only those in the know would spot FISERV as the only beneficiary of this verbiage. Compared to the Foxconn part of the bill, the aid for FISERV, capped at $10 million is chicken feed. As the New York Times headlined its article on the Foxconn agreement, Wisconsin’s Lavish Lure for Foxconn: $3 Billion in Tax Subsidies. Just how lavish is the lure? According to the Legislative Fiscal Bureau’s analysis of the Foxconn bill, the company would gain two refundable tax credits. First, Wisconsin would reimburse Foxconn for 15 percent of its capital expenditures for the Wisconsin plant. This credit would be capped at $1.35 billion. The second would pay for 17 percent of Foxconn’s payroll and be capped at $1.5 billion. The next graph shows the LFB’s projection of the cost of these two credits. 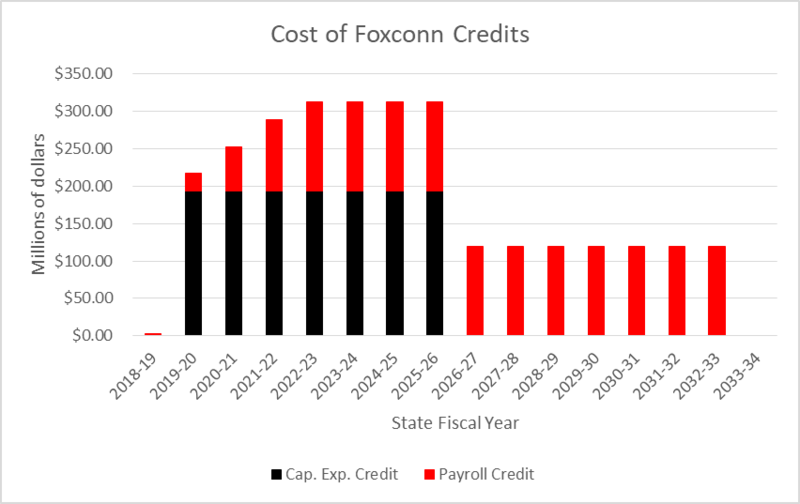 Because the Manufacturing and Agriculture Tax Credit would leave Foxconn with little or no tax liability even before the new credits kicked in, these credits would result in cash payments to Foxconn, rather than a reduction in its tax liability. At the peak, between 2022 and 2026, about 2 percent of Wisconsin’s state revenue would go to Foxconn. The LFB, by necessity, makes a number of assumptions in its projection. One is that the average annual salary is $53,875, as estimated by Foxconn. Another is that all capital spending takes place in the first seven years, at which point the capital spending credit hits the cap. A third is that by the fourth year employment reaches the estimated maximum of 13,000. It is unclear how many jobs will actually be created by the Foxconn deal. While a fact sheet from the WEDC flatly asserts “it will employ 13,000 workers,” the more cautious LFB inserts “up to” in front of that number. Although Foxconn would need to hire around 13,000 workers to get the full credit, there is no requirement that it do so. It appears that the hiring of 3,000 workers is a firmer commitment from Foxconn. Foxconn’s president has been quoted as desiring to more fully automate his plants. It has been suggested that if Foxconn heavily automated its plant, the number of employees could be radically reduced. In this scenario, the payroll tax credits drop substantially but the capital expenditure credits continue, shown in the next chart. In this case the total cost of the credits would go down, but the cost per job would rise. 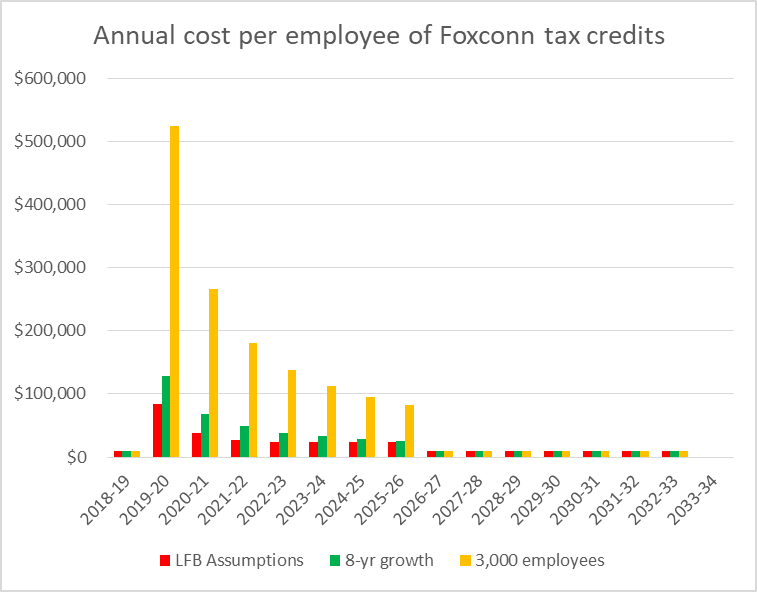 The next graph shows the annual cost per employee of Foxconn payments under three scenarios: (1) assuming the LFB’s projections are met, and Foxconn hits 13,000 jobs in the fourth year, shown in red; (2) assuming that employment takes seven years to reach its peak of 13,000, in sync with capital spending, shown in green; and (3) assuming employment levels off at 3,000 rather than 13,000, shown in yellow. 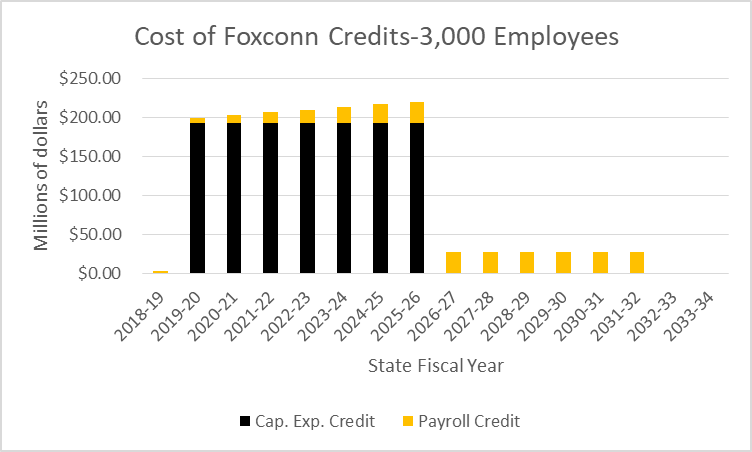 While the third strategy reduces the state payments to Foxconn (as shown above), the payment per job created increases substantially (as shown below). Over the entire 15-year period under the LFB’s assumptions, Wisconsin would pay Foxconn a total of $218,516 per job created. If, instead, the number of jobs topped out at 3,000, the cost per job would rise to $546,958. It should be remembered that the total cost is likely to be substantially higher when sales tax exemptions and things like training and infrastructure costs at both the state and local level are factored in. 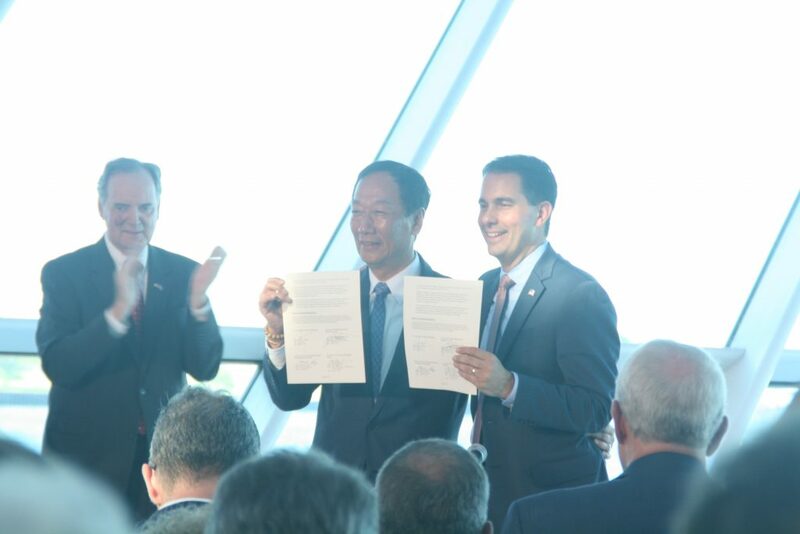 WEDC’s fact sheet describes the Foxconn proposal as “transformational.” In its words, “Foxconn is bringing the future of manufacturing to the U.S., and Wisconsin will be the leader.” This term has been picked up by other supporters of the Foxconn tax credits. Certainly the proposal is very large, but one has to worry that the enthusiasm it has generated reflects nostalgia for the Allis-Chalmers era of very large employers who hired lots of people. Does this nostalgia for past economic success get in the way of carefully analyzing the Foxconn deal, and doing this in the context of a sophisticated analysis of what it will take to move Wisconsin into the new economy? If this were really about poverty, wouldn’t there be some provision regarding transportation of workers to the jobs as well as job training requirements? The amendment for a regional transportation authority was turned down in committee along with all others which may have addressed some of this. Currently the only mass transit option in the area originates in Chicago and terminates in downtown Kenosha and I haven’t read of any plans or even ideas about extending any sort of transit services to any of the sites but maybe that will happen later? Well if this works only about 200,000 more jobs to reach the Governor’s 2014 goal! The Wisconsin legislature got away with this before creating American Transmission Company in a 1999 bill under the Thompson administration. That was private legislation granting corporate powers to a single entity if ever there was one. The Foxxcon legislation would seem to have the same problem if the promoters of this corporate entity had not had the foresight to camouflage the legislation with generalities that will at least protect it from any direct challenge. A few words of legal mumbo-jumbo are all it takes to stupify the Wisconsin Supreme Court unless, of course, one of the privileged few’s interests are implicated.